....nor any drop to drink. The Rime of the Ancient Mariner. Sending any shivers of terror down any English A level student's backs? One of the most wrongly quoted quotes and tediously long poems. I was fortunate enough to meet the American Dermatologist who has products to solve any concern your complexion is facing, with the perfect prescription for pretty skin. And what he was saying was really skinnnovative (haha). Dr Muard made me do a complete 180 on what I thought about water and hydration. To cut a long story short after a trip to Ayia Napa in year 13 (shout out to any of my Briggstowners reading this) when I was convinced I had sun stroke and had to drink enough water to flush it out my system (in reality I was probably just hung over), I have been obsessed with water. Me and my best friend have coined the phrase 'the point of no return', the horrific headache you get from not being hydrated enough. To me hydration is my first litre of water upon waking up, my second by lunch time and my third by the time I go to bed. 8 glasses? Blah, more like 20. The fact that I am constantly needing to pee aside I don't always feel that hydrated, I can still get headaches and my skin still suffers from dehydration. According to Dr Murad the recommended 8 glasses of water originated from a study in the 1940s- so it is in more than a little need of updating. Dr Murad claims (in his lurvely American accent may I add) that you should eat your water not drink it. Think of it like a plant (my analogy here- so sorry Dr Murad if it's not quite right). Give a plant with that dry, cracked soil you get from negligence to plants (guilty) a whole lot of water at once, and it may soak it in like there's no tomorrow but, it won't change the texture of that soil. What i'm trying to say is that downing glasses of water mostly leads to incessant trips to the toilet. Get your hydration from fruit and veg for a more sustainable source, plus you'll get all the other benefits from veggies, antioxidants and anti-inflammatories to name a few. 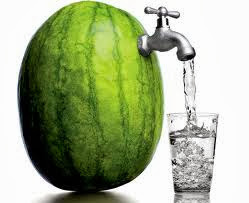 Cucumber and watermelon are both 97% water so great thirst quenching, skin saving options. Dr Murad has studied the science of cellular water and he believes that the key measure of health is the cell's ability to hold water. Ergo, if we build stronger cells, through hydration, we can fight disease and reverse the signs of ageing. Hydrated cells will help with everything from dryness, fine lines and wrinkles to blemishes and scarring. Hydration. The fountain of youth.